If you’re like most people, you feel younger than you look. You want your reflection to mirror what you feel. Now, younger looking skin is finally possible. ELASTIderm uses Obagi’s exclusive Penetrating Therapeutics™, an effective patented technology that allows for greater penetration of an active agent across the skin barrier to stimulate functional elasticity and resilient strength of the skin. Formulated with a novel, bi-mineral complex that works to replenish elastin to support collagen and give skin functional elasticity, ELASTIderm was shown to be effective in improving the elasticity of photoaged skin and visibly reducing periorbital lines. A significant increase in elasticity was achieved within only two weeks and elasticity continued to increase over an eight-week period. Water (Aqua), Ethylhexyl Palmitate, C13-15 Alkane, Glycerin, Cyclopentasiloxane, Glyceryl Stearate, C12-15 Alkyl Benzoate, Peg-100 Stearate, Dimethicone, Dipropylene Glycol Dibenzoate, Propylene Glycol, Stearyl Alcohol, Ppg-15 Stearyl Ether Benzoate, Polyacrylamide, Cetyl Alcohol, Cetyl Dimethicone, C13-14 Isoparaffin, Xanthan Gum, Magnesium Aluminum Silicate, Laureth-7, Tocopheryl Acetate, Glycyrrhiza Glabra (Licorice) Root Extract, Algae Extract, Vaccinium Angustifolium (Blueberry) Fruit Extract, Phenoxyethanol, Methylparaben, Ethylparaben, Butylparaben, Propylparaben, Isobutylparaben, Hdi/Trimethylol Hexyllactone Crosspolymer, Sodium Hydroxide, Malonic Acid, Malachite, Zinc Carbonate, Silica, Talc, Alumina, Mica, Titanium Dioxide(Ci 77891), Iron Oxides (Ci 77491). I was already using a firming eye treatment from another brand that I was fine with, when I read an article from a beauty blogger who raved about the Obagi Eye Treatment. I decided to give it a try, and I swear the skin under my eyes looks so much smoother and firmer. This really works! Packaging could be better as it is very plain however the product is amazing. Love that it is backed up by medical research. Lightweight and notice difference to my eye area. 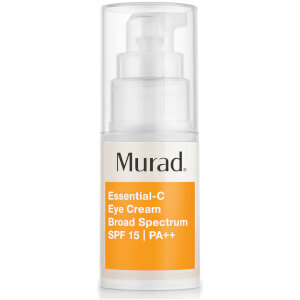 This eye cream is super lightweight and keeps my eye area hydrated and smooth. Love the fact that this product is backed up by medical research and you can really tell with the product quality and output The blue cream took me by surprise but went on smoothly At a high price point, I would buy this again but will have to wait for a few pay checks! This product works wonders! I use this of a night and I can see the difference in the morning! You can actually feel this working, it glides on and within seconds I felt the skin under my eyes tightening. I use it every morning before my moisturiser and give it a few minutes to fully soak in. I've been using two weeks now and notice a difference!! Anxious to see how well the skin under my eyes look in a month! Made a go of it twice both times with met with failure. My lines under my eyes actually got worse and found it created a burning sensaton around my eyes.Would not recommend. For me Elastiderm is one of the best cream. I'm 49 and was very concern of my under eye lines, I love Obagi product so I decide it to give it a try and is very good. My lines are a lot less visible. I'll definitely keep this one as part of my beauty regime. I am now scraping the bottom the jar, and after about 4 months, I'm ready to move to something else. Did not feel like it was very hydrating would put in on par with oil of olay, but a heftier price tag. Other products definitely soften fine lines better. After using this product for several weeks, I noticed that my under eye area was worse, not better. The fine lines and dark circles had been accentuated. As stated by another review, it made the problem worse, not better. Also, I noticed when I put it on, it stung a bit? don't know what that was about... Save your money and find a better eye cream.